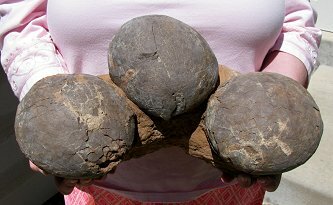 Size: Nest is 14" across, each egg is about 5.5"
This is a very nice hadrosaur egg nest from the Cretaceous Period of China. These Dendroolithus eggs have been microscopically-prepared with an air-abrasive machine in the EXTINCTIONS Preparation Lab to reveal the fine detail of the eggshell. The eggshell is intact and covers most of the surface of the eggs. The eggs are very inflated and are beautifully showcased on top of the natural pedestal of matrix. The overall ''egg'' shape is great on all three eggs. This is one of only a few three-egg Hadrosaur nests ever found and offered for sale.